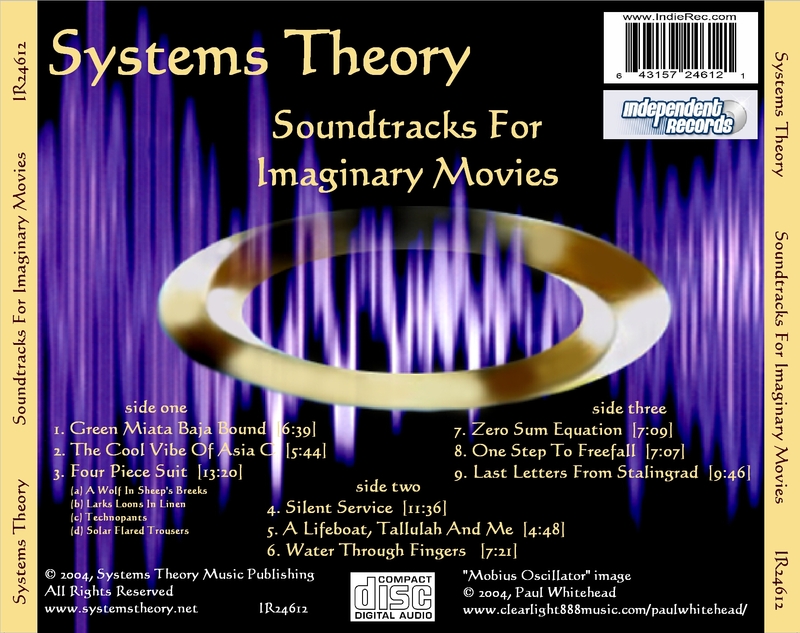 This is the free release of our first album Soundtracks for Imaginary Movies. As we are settled now that we are likely to have sold as many as we are ever liklely to sell, the music is now up here for free for you to enjoy to your heart's content. We are also releasing it as a tribute to our collaborator, friend and brother Greg who was lost to us on 3rd November 2009. This music took an incredible amount of time to see the light of day, mostly because of the logistics of getting it all together. If you have heard our earlier demos you will no doubt detect a progression from those earlier attempts, up to the more sophisticated arrangements found on this CD. It may seem strange, but the first track to be recorded for SfIM was The Cool Vibe of Asia C which was really the first time we tried to work together in a musical collaboration, as opposed to a SMiLE-like attempt to piece together broken fragments of non-existent music into something coherent. the jump from the demos to this form of working was a sudden one. Our way of working emerged into a strange, iterative process where the original composer would submit a (usually) incomplete piece to the others who would take turns in modifying it or amending bits of it - or even rearranging it - to suit themselves. It would eventually work its way back to the composer who would then have the right to veto anything that was musically horrible to him (although this didn't happen often). The music is arranged into three sides of about twenty minutes each, reflecting the manner in which vinyl used to get laid out, along with some ideas about sequencing - the proggy stuff is on side one, the watery trilogy is on side two and the deep down melodramatic movie soundtracks are on the closing side. Talking of which - the title of the CD is no accident. Close your eyes and dream what you see. This writer and Mellotronist well recalls what passed through his mind when he sat down and listened to Steven's final mix down of the album as a whole. It was like being in the front row of a cinema show designed and performed for you and you alone. We hope that it comes over that way to you as well. You can also read reviews of the CD here, most of which are pretty positive. A few of them are even ecstatic! Here are the image files that contains the artwork for the main cover and the CD tray. This way you can make up your own version of the album if you want to play it on your hi fidelity music reproduction system. Thanks for listening. Any comments are welcomed on our guest book.